Powers/Abilities: Hedy Wolfe is a talented entrepreneur, though she has no known super human abilities. (Avengers Annual 2000 (fb) - BTS) - Along with the entire town of Centerville, California, Hedy Wolfe was signed up by Dorothy Walker to be licensed as a character in various mediums, including comic books, games, and even a TV show, though Patsy Walker was the title star of all the merchandise. (Avengers I#144 (fb)) - Patsy and her best friend, Hedy Wolfe, grew up surfing, studying, dancing, romancing, and constantly battling each other. (Fantastic Four Annual#3/Marvels#2) - Patsy and Hedy attended the wedding of Mister Fantastic and Invisible Girl, and marveled at all the celebrities there, including Millie the Model and Tony Stark. (Marvel Fanfare I#59) - Hedy, married and living off of her royalties, met up with Patsy and Nan back in Centerville for a brief reunion. (Avengers Annual 2000 (fb) - BTS) - After Dorothy Walker passed away, Hedy took over Patsy Walker Properties and renamed the company Patsy-Hedy Entertainment. She began marketing Centerville as a destination resort/amusement park, designed to be America’s perfect small town. 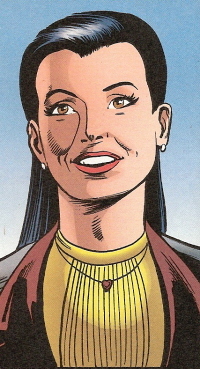 (Avengers Annual 2000) - Since Patsy was back from the dead, Hedy agreed to meet her on the All-New It’s Amazing show, with hosts Marc Sanders and Diane Cummings. She greeted Patsy and invited her back to Centerville. She showed Patsy around and reintroduced her to many of their childhood friends, including Tom “Tubs” Hale, Nan Hale, Mickey Walker (Patsy’s brother), Mr. Wolfe (Hedy’s father), Rod, and Miss Bliss. Patsy then met the new Mayor Nicholas and Russell Daboia, Hedy’s resort management executive. Later, Patsy and Hedy were captured by the town’s population, realizing they’d all been possessed by demons. Hellcat’s allies (Captain America (Steve Rogers), Hawkeye (Clint Barton), Iron Man (Tony Stark), Moondragon, Scarlet Witch, Songbird) arrived and freed Patsy and Hedy, then returned to battle Daboia, who’d become a large snake being, and his minions, the Sons of the Serpent and Salem’s Seven (Brutacus, Gazelle, Hydron, Reptilla, Thornn, Vakume, Vertigo). The heroes were captured, but Hedy saved the day by tipping over Daboia’s mystic brazier, defeating the villains and freeing the heroes. (Hellcat#1) - Hedy greeted Patsy alongside Mayor Nicholas in Centerville, then took Patsy inside, commenting on the state of the town and Patsy's decorating plans. Patsy broke down to Hedy a little bit, stating that her life had been so hard and not at all what she'd planned, and Hedy comforted her. Patsy told Hedy that Nicholas was a dark magician, having sensed it with her powers, and both women were shocked when demons attacked the house. Hellcat summoned a new costume with her mind and commented that her mind and body were both completely in tune and honed to total awareness now. Hellcat defeated the demons, then rushed off to face Nicholas, who turned out to be Nicholas Scratch in the service of Dormammu. Hedy watched her go into Scratch's room, where Hellcat disrupted Scratch's spell, but the heroine was taken to Dormammu's realm. (Hellcat#2) - Hedy rushed to New York for aid, demanding Jarvis let her into Avengers mansion and petitioning the Scarlet Witch to do something magical to save Hellcat. Scarlet Witch agreed to help and she and Hedy left to return to California. While they flew, Scarlet Witch began calling Hellcat's friends for help, telling them to meet her in Centerville. (Hellcat#3) - Hellcat's friends Beast (Hank McCoy), Captain America (Steve Rogers), Hawkeye (Clint Barton), Moondragon, Songbird, Sub-Mariner, Valkyrie (Brunnhilde), and Wonder Man gathered to aid her. Hellcat soon returned, hugging Hedy. Hedy Wolfe first appeared in the various "Patsy Walker" comics, which aren't necessarily considered Marvel canon, and this profile is only meant to corroborate the information revealed about her in the "modern age." (Avengers Annual 2000 (fb) - BTS) - The teacher of Patsy Walker and Hedy Wolfe, Miss Bliss was marketed along with the entire town of Centerville, California as a comic book and television character. At some point, the residents of Centerville were all influenced by the demons of Russell Daboia into doing his bidding. (Avengers Annual 2000) - Miss Bliss greeted Patsy when she returned to Centerville for the first time in years. Patsy and her heroic allies later defeated Daboia and freed the souls of those of Centerville. (Avengers Annual 2000 (fb) - BTS) - A childhood friend of Patsy Walker and Hedy Wolfe, Donald Grant was marketed along with the entire town of Centerville, California as a comic book and television character. Donald later married Mary Meeke. At some point, the residents of Centerville were all influenced by the demons of Russell Daboia into doing his bidding. (Avengers Annual 2000) - Donald and Mary greeted Patsy when she returned to Centerville for the first time in years. When she noticed the demon energy around them, Donald and others tried to apprehend Patsy, who turned into Hellcat and fled. Patsy and her heroic allies later defeated Daboia and freed the souls of those of Centerville. (Avengers Annual 2000 (fb) - BTS) - A childhood friend of Patsy Walker and Hedy Wolfe, Mary Meeke was marketed along with the entire town of Centerville, California as a comic book and television character. She later married Donald Grant. At some point, the residents of Centerville were all influenced by the demons of Russell Daboia into doing his bidding. (Avengers Annual 2000) - Mary and Donald greeted Patsy when she returned to Centerville for the first time in years. When she noticed the demon energy around them, Mary and others tried to apprehend Patsy, who turned into Hellcat and fled. Patsy and her heroic allies later defeated Daboia and freed the souls of those of Centerville. (Avengers Annual 2000) - Hedy Wolfe’s chauffer, Groves, drove her and Patsy Walker through Centerville, California, and got them a golf cart when requested. (Avengers Annual 2000 (fb) - BTS) - A childhood friend of Patsy Walker and Hedy Wolfe, Nancy "Nan" Brown was marketed along with the entire town of Centerville, California as a comic book and television character. (Marvel Fanfare I#59) - At some point Nan got married to Tom Hale. They expected their second child when she was briefly reunited with Hedy and Patsy, who brought her husband, Daimon Hellstrom, with her. Nan confessed that she was living off her royalties from her old comic book appearances. (Avengers Annual 2000 (fb) - BTS) - At some point, the residents of Centerville were all influenced by the demons of Russell Daboia into doing his bidding. (Avengers Annual 2000) - Nan greeted Patsy when she returned to Centerville for the first time in years. She and Mickey Walker joined Patsy and Hedy on a tour of the town, even seeing the Petal-Tubs named in honor of she and “Tubs” Hale. Patsy and her heroic allies later defeated Daboia and freed the souls of those of Centerville. (Avengers Annual 2000 (fb) - BTS) - A childhood friend of Patsy Walker and Hedy Wolfe, “Tubs” Hale was marketed along with the entire town of Centerville, California as a comic book and television character. Later, he purchased Krautmann’s Sodas. (Marvel Fanfare I#59) - At some point Tubs got married to Nan Brown. They expected their second child when Patsy visited Centerville with her new husband Daimon Hellstrom. (Avengers Annual 2000) - “Tubs” greeted Patsy when she returned to Centerville for the first time in years. Patsy and her heroic allies later defeated Daboia and freed the souls of those of Centerville. (Avengers Annual 2000 (fb) - BTS) - The owner of Krautmann’s Sodas in Centerville , California, Mr. Krautmann was marketed along with the entire town of Centerville, California as a comic book and television character. He later passed on. (Avengers Annual 2000 (fb) - BTS) - A childhood friend of Patsy Walker and Hedy Wolfe, Rod was marketed along with the entire town of Centerville, California as a comic book and television character. (Marvel Fanfare I#59) - During Patsy's visit to Centerville with her husband Daimon, Rodney attacked Daimon at a nightclub. (Avengers Annual 2000) - Rod greeted Patsy when she returned to Centerville for the first time in years. When she noticed the demon energy around them, Rod and others tried to apprehend Patsy, who turned into Hellcat and fled. Patsy and her heroic allies later defeated Daboia and freed the souls of those of Centerville. (Avengers Annual 2000 (fb) - BTS) - A childhood friend of Patsy Walker and Hedy Wolfe, Specs was marketed along with the entire town of Centerville, California as a comic book and television character. At some point, the residents of Centerville were all influenced by the demons of Russell Daboia into doing his bidding. (Avengers Annual 2000) - Specs greeted Patsy when she returned to Centerville for the first time in years. When she noticed the demon energy around them, Specs and others tried to apprehend Patsy, who turned into Hellcat and fled. Patsy and her heroic allies later defeated Daboia and freed the souls of those of Centerville. (Avengers Annual 2000 (fb) - BTS) - A childhood friend of Patsy Walker and Hedy Wolfe, Susan was marketed along with the entire town of Centerville, California as a comic book and television character. At some point, the residents of Centerville were all influenced by the demons of Russell Daboia into doing his bidding. (Avengers Annual 2000) - Susan greeted Patsy when she returned to Centerville for the first time in years. When she noticed the demon energy around them, Susan and others tried to apprehend Patsy, who turned into Hellcat and fled. Patsy and her heroic allies later defeated Daboia and freed the souls of those of Centerville. (Avengers Annual 2000 (fb) - BTS) - Mickey Walker, younger brother of Patsy Walker and son of Joshua and Dorothy Walker, was marketed along with the entire town of Centerville, California as a comic book and television character. His parents and sister were later reported deceased. (Marvel Fanfare I#59 - BTS) - Patsy's brother Mike was reported as being away at college. He was frequently visited by Patsy and Daimon. (Avengers Annual 2000) - At some point, the residents of Centerville were all influenced by the demons of Russell Daboia into doing his bidding. Mickey greeted Patsy, who had recently come back to life, when she returned to Centerville for the first time in years. They hugged each other, then Mickey and Nan Hale joined Patsy and Hedy Wolfe on a tour of the town (Mickey was embarrassed that a merry-go-round was named after him), then Mickey and Patsy went to their old house. He grew frustrated when she walked out on her own. Patsy and her heroic allies later defeated Daboia and freed the souls of those of Centerville. (Avengers Annual 2000 (fb) - BTS) - The father of Hedy Wolfe, Mr. Wolfe was marketed along with the entire town of Centerville, California as a comic book and television character. At some point, the residents of Centerville were all influenced by the demons of Russell Daboia into doing his bidding. (Avengers Annual 2000) - Mr. Wolfe greeted Patsy when she returned to Centerville for the first time in years. Patsy and her heroic allies later defeated Daboia and freed the souls of those of Centerville.